Incorrect Instructions on Verdict Form for Count 1 – Fundamental Error?? Count 2 still in question. In considering the evidence, you should consider the possibility that although the evidence may not convince you that the defendant committed the main crimes of which he is accused, there may be evidence that he committed other acts that would constitute a lesser­ included crimes. The lesser crimes indicated in the definition of Attempted Robbery with a Firearm are Attempted Robbery with a Deadly Weapon, Attempted Robbery with a Weapon, Robbery, and Petit Theft. Note that On the Verdict Form for Count 1, it list the lessers as Robbery with a Deadly Weapon, Robbery with a Weapon, Robbery, and Petit Theft. The Attempted part was omitted. What choice did the juror have but to pick Attempted Robbery with a Firearm as they know that Robbery was never the intended charge? The jury did not deliberate on whether defendant was guilty of the lesser included offenses. Also, The instructions for Theft was read for Petit Theft. Lastly, I do not even know if attempted crimes even have lessers. Based on 777.04(1), Fla. Stat. No lesser included offenses have been identified for this offense. “[D]ue process requires that a defendant be accorded the right to have a Court correctly and intelligently instruct the jury on the essential and material elements of the crime charged and required to be proven by competent evidence.” McCain v. State, 995 So. 2d 1029, 1033 (Fla. 2d DCA 2008) (citation omitted. Florida courts have consistently found fundamental error when erroneous jury instructions prevent the jury from properly determining the application of lesser offense . See, e.g., State v. Montgomery, 39 So. 3d 252, 257-60 (Fla. 2010). Florida courts have also found fundamental error when there is a defect on the verdict form. See, e. ., Hills v. State, 994 So. 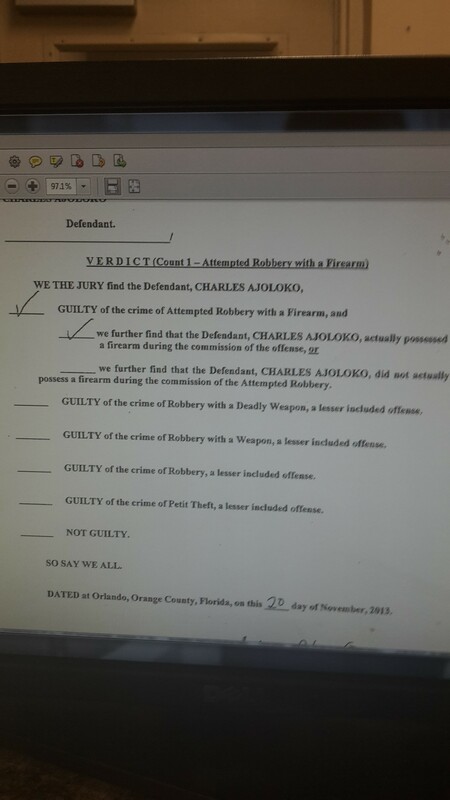 2d 412, 413 (Fla. 3d DCA 2008) (“Thus, we are not certain that the jury understood its options, authority, or responsibility on the burglary count.”). In my son’s case of the attempted robbery count. Accordingly, where the trial court fails to correctly instruct on an element of the crime over which there is dispute, and that element is both pertinent and material to what the jury must consider in order to decide if the defendant is guilty of the crime charged or any of its lesser included offenses, fundamental error occurs. Daniels, 121 So. 3d at 418; see also Haygood v. State, 109 So. 3d 735, 741 (Fla.2013) (“[F]undamental error occurs in a jury instruction where the instruction pertains to a disputed element of the offense and the error is pertinent or material to what the jury must consider to convict..
“If the jury is not properly instructed on the next lower crime, then it is impossible to determine whether, having been properly instructed, it would have found the defendant guilty of the next lesser offense.” Pena v. State, 901 So. 2d 781, 787 (Fla. 2005).